The Chemical Guys Jetstream Fire Hose Nozzle turns any normal garden hose into a high pressure water jet. The rugged brass nozzle is resistant to corrosion, drops, and bumps around any home or industrial setting. The Jetstream Nozzle attaches to any standard garden hose, and the fully-adjustable screw action sprayer puts out a powerful jet stream, wide gentle fan, and everything in between. Blast off stuck-on mud, bird droppings, dirt, and grime from any car, truck, motorcycle, SUV, or ATV in seconds. Steel reinforcements protect the body of the nozzle from blunt force impacts and prevents crushing if the nozzle is ever run over by a car or truck. Soft rubber grips at the front and back of the nozzle ensure a secure hold, and help protect sensitive surfaces against bumps and scrapes. Custom precision machined brass internals resist corrosion and decay, and increase water pressure from a gentle burble into a powerful stream. Triple internal O-ring system ensures smooth sliding action with zero leaks and zero loss of water pressure. 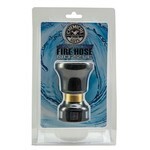 The Jetstream Fire Hose Nozzle works great around any home or industrial setting. Using the powerful stream cleans vehicles and equipment in less time, and with less water for desired results. Use any powerful or gentle setting on the Jetstream Nozzle for washing, gardening, rinsing, and cleaning on any vehicle, patio, house siding, garden, garage, or industrial equipment or setting. Invest in the Chemical Guys Jetstream Fire Hose Nozzle for a versatile, powerful, and rugged nozzle that will last for years of reliable use. 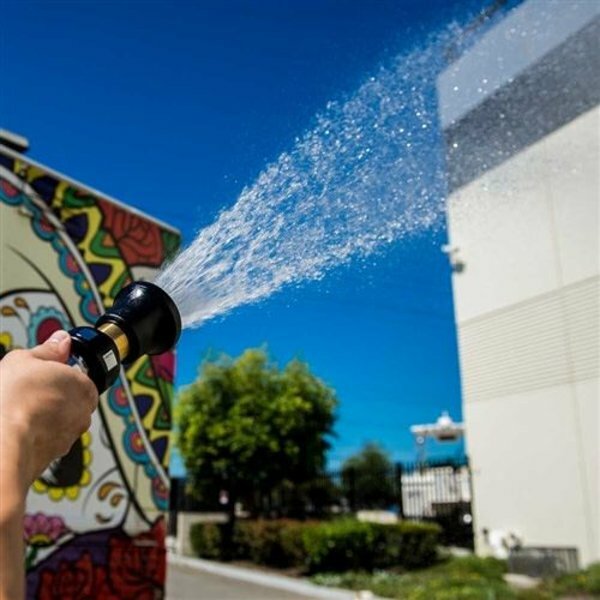 The Jetstream Fire Hose Nozzle turns any gentle garden hose into a powerful water blaster. 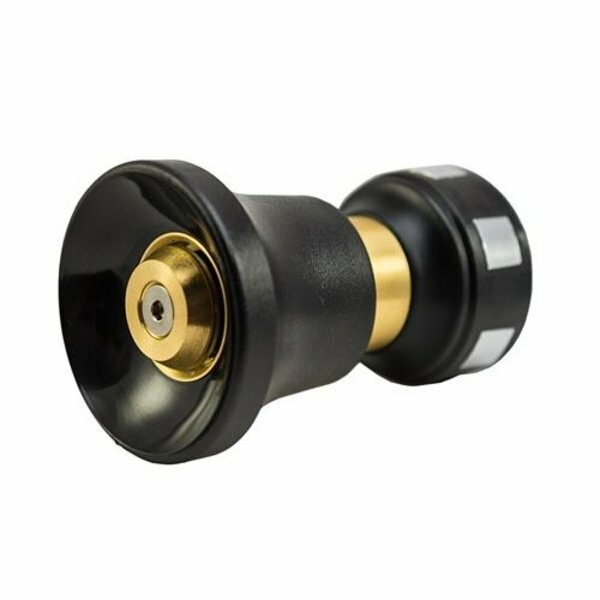 Precision machined brass internals increase water pressure over 500%, which blasts away more dirt and debris in less time and with less water than with an open flowing hose. 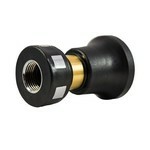 Attach the Jetstream nozzle onto any standard garden hose, then twist the forward grip to start spraying water. The infinite-adjustment screw action sprays any pattern from light mist, powerful jet stream, and fine gentle fan of water. Use any spray pattern needed to clean and detail cars, trucks, motorcycles, SUVs, RVs, and ATVs in seconds. Wash away heavy dirt, mud, and grime from off road vehicles and city cruisers. Rinse away grease and oil from engine bays and undercarriage parts. Hose down driveways, patios, house siding, gutters, and more. 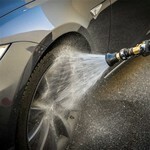 Choose the Chemical Guys Jetstream Hose Nozzle for every car wash, detail, or household chore and cleanup. High grade materials can last a lifetime. 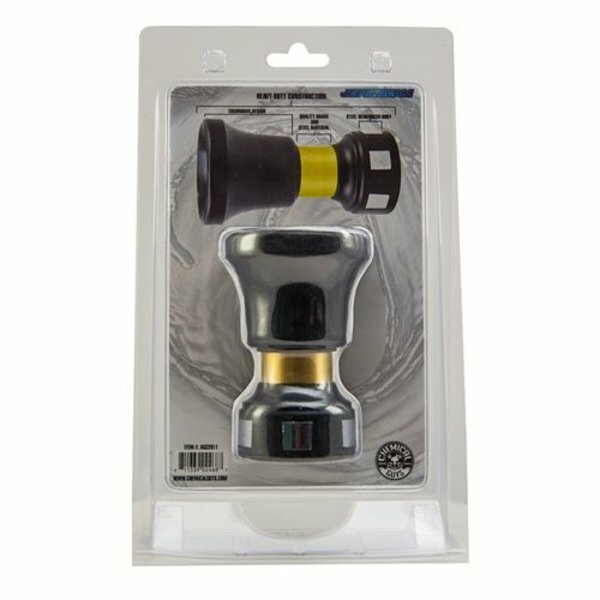 Cheap hardware store nozzles are made with bare aluminum, raw steel, and thin plastic. After a couple weeks of normal use, internal components break and leak. One or two drops can destroy cheap nozzles, and leaving them out in the elements cause rust and permanent sun damage. Chemical Guys designed the Jetstream nozzle with premium brass, insulated steel, and soft rubber components. The heavy duty materials and casing resist damage from crushing, drops, and corrosion from water, UV sunlight, and time. The Jetstream Fire Hose Nozzle is designed to last for years of reliable use for auto detailing, housework, garden work, and cleanups around the garage, patio, and industrial workplace. Use the infinite adjustment stream for powerful cleaning, or gentle watering, and for anything in between. 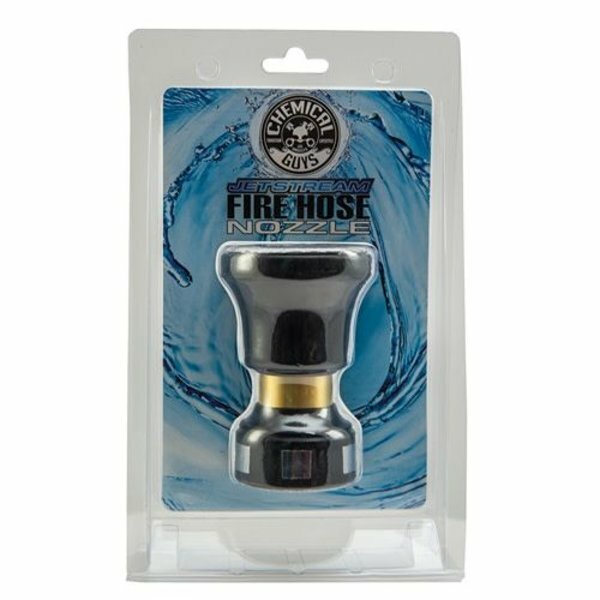 Pick up the heavy duty Jetstream Fire Hose Nozzle for every home, work, or industrial job. Leaving the garden hose running during a car wash can waste hundreds of gallons of water in just a few minutes. Responsible detailing requires saving resources and using biodegradable products that will not harm the biosphere. The Jetstream Fire Hose Nozzle attaches to any standard garden hose and adjusts to produce a gentle fan, powerful stream, or shut completely off to stop the flow of water. With the Jetstream nozzle, detailers, enthusiasts, and homeowners can save thousands of gallons of water every year by only using what they need, then twisting off the flow when they 're done. The Jetstream nozzle also increases the water pressure for more efficient cleaning on any surface, like automobiles, siding, floors, and equipment. The Jetstream Fire Hose Nozzle gets more cleaning done in less time with less water. Detail, clean, and water responsibly with the Chemical Guys Jetstream Fire Hose Nozzle.